The ArxLab Electronic Laboratory Notebook and cloud suite of applications offer a fully integrated data management platform for collaborative research across internal and external partners. Managing projects within an organization and across CROs is a challenge. Without centralized data it is even harder. A centralized request management system saves time and increases efficiency. A common concern about deploying an electronic lab notebook is the length of time it takes from signing a P/O to going live. Learn how to take only one day from purchase order to production. One of the biggest fears about adopting a new data management system is cost. Understand how to save money using an ELN versus an inefficient hybrid system of paper and Excel. Project managers need to orchestrate all internal and external partners efficiently. Using a centralized system expedites coordination of research programs in real time, increasing productivity. When data is siloed it is a barrier to insights and trends. Accessing centralized data from across ELN, Registry, Inventory and Assay systems empowers more informed decisions. Concerns exist about cloud-based solutions (costs of an ELN and significant IT resources etc). In reality, most paper-based companies are inefficient. Paperless labs maximize productivity. Managing chemistry data across an enterprise is a challenge without a centralized management system. 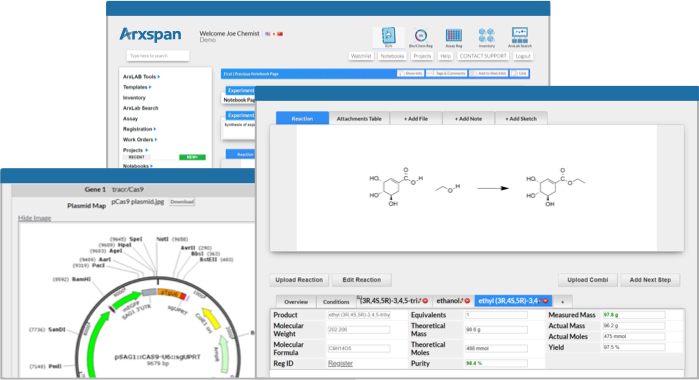 Manage workflows across synthetic, analytical, and process chemistry using ArxLab. Biologists face complex workflows (in vitro, in vivo, screening, assay and DMPK data), making management of data challenging. Centrally manage research without losing legacy information.